Autoinflammatory diseases encompass a spectrum of diseases characterized by dysfunction of the innate immune system. Until recently, these diseases were largely classified and diagnosed by the clinical presentation. The recent years have seen the delineation of the molecular mechanisms and specific molecular markers for diagnosing these illnesses.A number of autoinflammatory diseases have well established genetic basis and associated variations as described in literature. Several such diseases also have strong geographical preponderance. Diagnosis of these conditions, therefore, requires an intense clinical suspicion and sound molecular evidence, especially in regions where the prevalence is low. 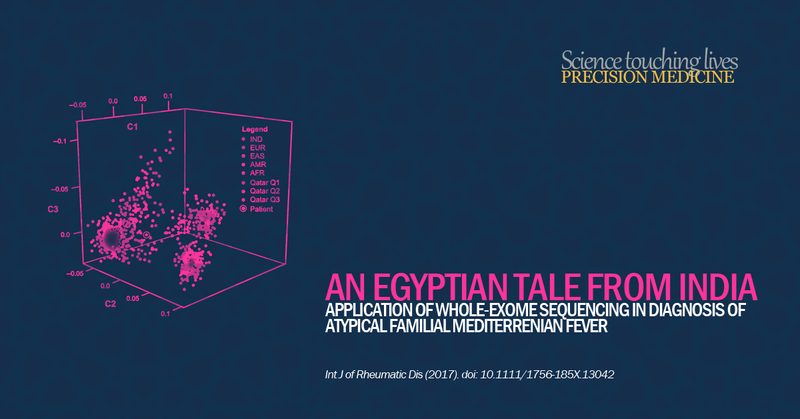 In this manuscript, we report a case of atypical familial Mediterranean fever (FMF) in an Asian Indian patient whose ancestry could be traced to Egypt.